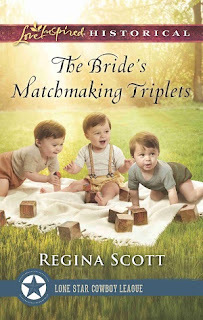 If you’ve been following the blog, you know that the Lone Star Cowboy League: Multiple Blessings series winds up this month with my contribution: The Bride’s Matchmaking Triplets. I enjoyed returning to Little Horn, Texas, after last year’s A Rancher of Convenience. I hope you will too. It’s only for the triplets’ sake—that’s what Brandon tells himself. Insecurities once drove him and Elizabeth apart, and now small-town rumors have made them man and wife. And though Brandon doesn’t want to risk his heart again, he’s not sure he can resist the feelings that are once again starting to bloom for Elizabeth. But can he convince her that this sweet surprise family is more than just convenient? Her aunt Evangeline had been hosting one of her famous dinner parties. It was well known around Cambridge that Mrs. Dumont, wife of the influential financier, welcomed only the most interesting people to her table, so an invitation was cause to preen. As her niece, Elizabeth had dined with senators, adventurers, novelists, artists and scientists. That evening, attendees around the white damask-draped table had included the mayor and his wife, a man who had invented some sort of circuit for conducting electricity, an award-winning poet and the dean of the divinity school with his most promising student. As the least most notable person in the room, besides her, he would have had every right to sit quietly, speak only when directly addressed. Indeed, he had been quiet the first part of the meal. Then the inventor, a Mr. Lombard, had begun a paean to man’s ingenuity. “Why, even now, in New York, a pneumatic system brings warm air in winter and cool air in summer,” he boasted, sleeve of his black dress coat coming perilously close to dipping into his creamed asparagus as he waved a hand. Brandon had merely offered them all a charming smile as he reached for his crystal glass. “I think I’ll stick with the Author of invention instead of the implementer.” And he’d calmly taken a sip as if giving them all a moment to think about what he’d said. How could she not be drawn to such a man? He was only a year older than her, yet he seemed so confident, so sure of who he was and what he was meant to do. She’d envied him that. “Ready for this little fellow?” he asked her now, smiling on the infant in his arms. She remembered how it felt to be cradled close, those strong arms around her, making her feel safe, loved. If he was surprised by the urgency in her voice, he didn’t show it. But as they exchanged babies, his fingers brushed her sleeve and a tingle ran up her arm. Why was she was still so aware of him after all these years? Even as she began to feed Eli, Theo watching them, she felt Brandon beside her. He held each baby so gently, every movement effortless. No other man had ever made her feel that she could rely on him no matter what.